Simulating the interaction of a multibody mechanism with surrounding fluid is often an interesting but challenging task for many design engineers. 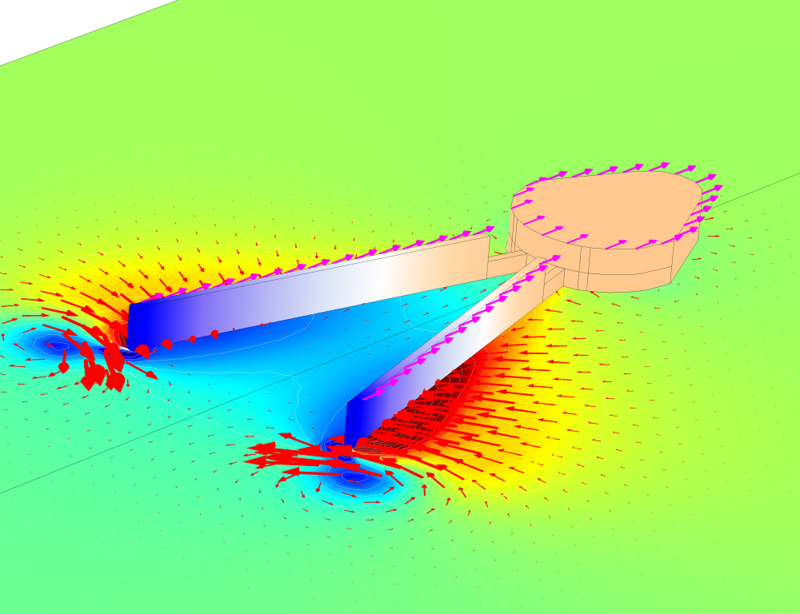 The COMSOL® software provides an easy solution for this problem with the Fluid-Structure Interaction, Pair multiphysics coupling, available as of version 5.4. In this blog post, we discuss the Fluid-Structure Interaction, Pair multiphysics coupling in detail along with an interesting example. Any multiphysics problem where a solid and fluid are coupled to influence the behavior of each other falls under the class of fluid-structure interaction (FSI). Generally, when a solid object is placed in the path of a fluid, the fluid applies pressure and viscous forces on the boundaries of the structure, leading to its deformation. The deformed structure, in turn, acts as a moving wall boundary for the fluid and changes the flow field. Depending on the type of interaction, it can be either unidirectional (a one-way coupling) or bidirectional (a two-way coupling). The main objective of FSI analysis is the computation of stress and strain in the structure as well as the velocity and pressure field of the fluid flow. FSI in a multibody assembly. While most of the conventional, analytical, or numerical methods for solving FSI problems demand intense efforts, the COMSOL Multiphysics® software simplifies the work with its inherent ability to easily couple different physics interfaces. 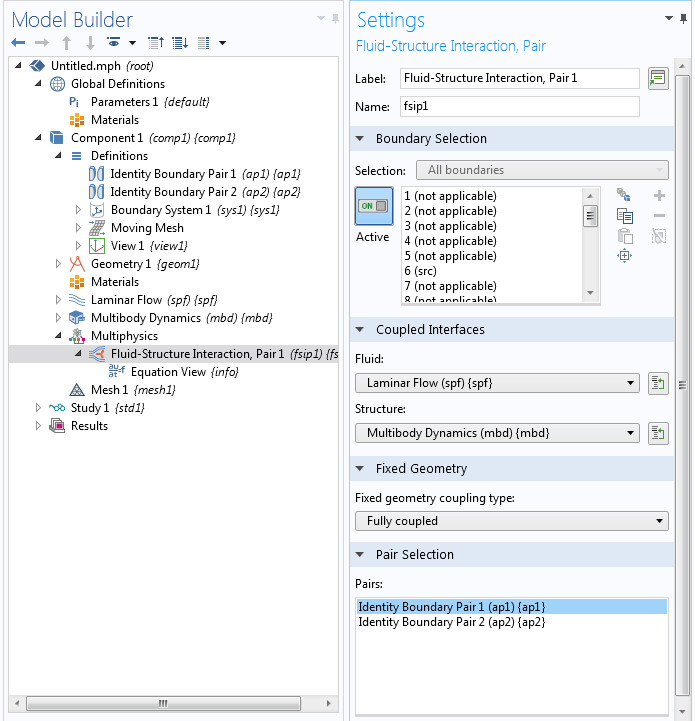 For modeling FSI problems, COMSOL Multiphysics provides a set of predefined multiphysics interfaces that can couple different structural mechanics interfaces (such as Solid Mechanics, Multibody Dynamics, Shell, and Membrane) with different fluid flow interfaces (either single-phase or multiphase flow). In addition to the respective structural mechanics and fluid flow interfaces, each of these predefined FSI interfaces also contains a multiphysics coupling. The fluid flow problem is defined on a moving mesh, called the spatial frame, while the solid mechanics problem is defined on the material frame. There is an additional set of equations that keeps track of the moving mesh using the deformation of the solid structure as boundary conditions. This method is called the arbitrary Lagrangian-Eulerian (ALE) method. The multiphysics coupling node provides the coupling between the fluid and the solid structure by accounting for the moving mesh and the deformation of the material as well as for transferring fluid forces to the structure. The Fluid-Structure Interaction feature is used in most of the general cases of FSI to model systems with relatively small motion between parts. In such cases, the fluid and solid physics interfaces in the model may share common boundaries. This is achieved in COMSOL Multiphysics by setting up the model geometry as a union of all geometry parts, which is the default behavior of the geometry sequence in COMSOL Multiphysics. You can find uses of this feature in various example models, including Vibrating Beam in Fluid Flow, Ball Check Valve, and Micropump Mechanism. Now, imagine an instance where you want to model the interaction of a multibody mechanism with a surrounding fluid, where individual parts may slide or move to a very large extent relative to each other. Some common examples could be a swimming mechanism or the flow of air around a wind turbine blade or a helicopter blade. The Fluid-Structure Interaction, Pair feature, available in version 5.4, easily takes care of this scenario. In such cases, the system geometry would have to be in an assembly state in order to cope with the large relative movements at the assembly boundaries. Force contributions are then specified on respective sides of the boundary pairs created between fluid and multibody boundaries. The table below summarizes the two FSI features. In this section, we will demonstrate how you can add the Fluid-Structure Interaction, Pair feature to your model either through a predefined multiphysics interface or separately. As mentioned earlier, COMSOL Multiphysics has different predefined FSI interfaces, with solid mechanics and fluid flow interfaces added in. Additionally, one of the two multiphysics couplings is also built in. Of those multiphysics interfaces, the Fluid-Multibody Interaction, Assembly interface, which is mainly designed for the modeling of multibody mechanisms interacting with surrounding flow fields, has the built-in Fluid-Structure Interaction, Pair feature. You can add the Fluid-Multibody Interaction, Assembly interface to your model from the list of Fluid-Structure Interaction interfaces in the Fluid Flow node in the Model Wizard, as shown in the figure below. This adds a predefined Laminar Flow interface, Multibody Dynamics interface, and multiphysics coupling node with the Fluid-Structure Interaction, Pair feature. It also contains a Moving Mesh node with a Deforming Domain subnode. 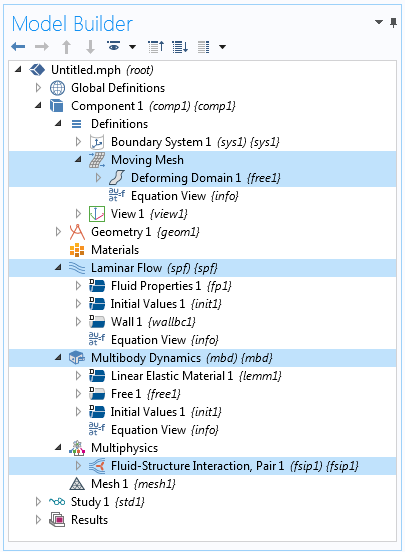 If you have not selected this predefined interface at the beginning, you can still couple your multibody dynamics and fluid flow physics interfaces during the course of modeling. Adding the Fluid-Multibody Interaction, Assembly interface in the Model Wizard. After adding the multiphysics interface, the Model Builder looks like the figure below. Here, the Multibody Dynamics interface is used for modeling the structural assembly of rigid or deformable solid bodies. The fluid flow can be modeled with one of the single-phase flow or multiphase flow interfaces. Model Builder after adding the Fluid-Multibody Interaction, Assembly interface. As mentioned, in order to apply the Fluid-Structure Interaction, Pair multiphysics coupling, you need to have your model geometry built in an assembly state. 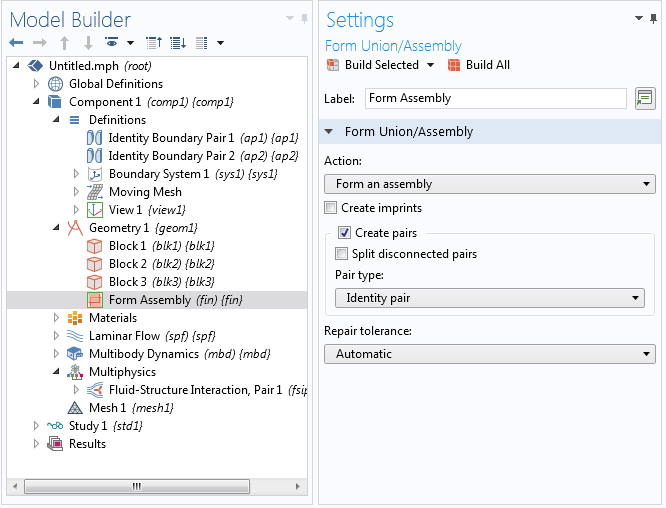 While creating the geometry in assembly mode, there is an option available to create boundary pairs automatically between all of the boundaries that are located at the same geometrical positions, but that belong to separate parts in an assembly. As shown in the figure below, this is possible through the Create pairs check box in the Settings window, which creates identity pairs between pairs of adjacent boundaries. All of these pairs are listed in the Pair Selection section of the Fluid-Structure Interaction, Pair feature. From this list, ideally, you need to select only those pairs that are relevant and between solid and fluid domains, however you can select all of the pairs, and this feature automatically ignores the pairs that are not between solid and fluid boundaries. Creating identity pairs and selecting them in the Fluid-Structure Interaction, Pair node. The geometrical changes happening in the fluid domain due to its interaction with the neighboring solid domain are modeled through the arbitrary Lagrangian-Eulerian (ALE) formulation mentioned above. For that, a Deforming Domain feature is added under the Moving Mesh node. This node has an empty selection by default, but you can assign it to the fluid domain that undergoes large geometrical changes. 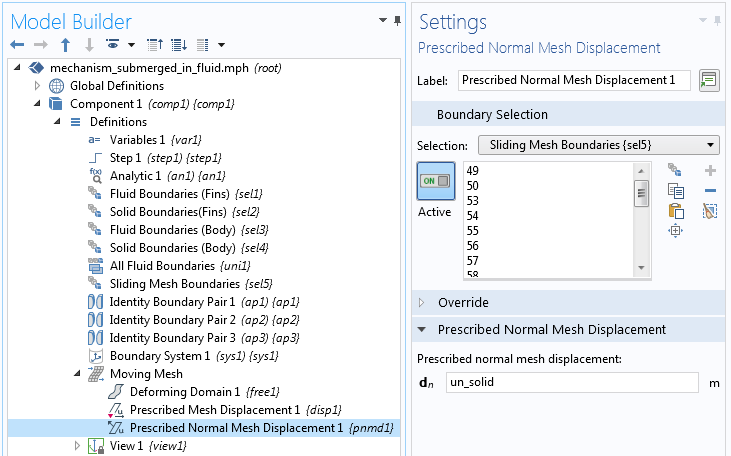 Different boundary conditions are available for specifying the motion of the moving mesh boundaries. Depending upon the dynamics of your mechanism, you can choose appropriate boundary conditions for the moving boundaries and transfer the relevant components of solid displacement to the spatial frame. This is possible with the help of a few built-in variables available in the coupling feature. For example, use a Prescribed Mesh Displacements boundary condition to transfer the motion of adjoining solids to the moving mesh, which sets the displacement of the mesh boundaries equal to the mapped solid boundaries of the identity pairs. Inspired by many of the FSI systems in nature, engineers have designed a number of mechanisms for various experimental and industrial examples. The Mechanism Submerged in Fluid model (available in the Application Gallery) is one such example. It simulates the motion of a mechanism submerged in a fluid channel, vaguely resembling the swimming motion or forward motion of a microorganism with the help of the locomotive structures at the back. The model here demonstrates the motion of a rigid body with two flexible fins in a flow channel. The fins are connected to the body through hinge joints, which permits their in-plane rotation. The motion of the mechanism is initiated by a prescribed rotation of the fins about the central body in a time-dependent manner. The fluid channel is described by the incompressible Navier-Stokes equations for the velocity field and the pressure in the spatial (i.e., deformed) moving coordinate system. The Multibody Dynamics interface is used to model the structural assembly. The geometrical changes in the fluid domain are incorporated in the model by assigning a deforming domain to the fluid part. As for transferring the motion of the solid elements to the spatial frame, two different types of moving mesh boundary conditions are used, as shown in the figure below. Transfer of solid motion to the moving mesh. Left: On the boundaries highlighted, all components of the solid motion are transferred to the adjacent moving mesh boundaries. Right: On the rear curved face highlighted, only the normal components of the solid motion are transferred to the moving mesh boundaries, keeping the mesh free to slide tangentially. A Prescribed Mesh Displacement boundary condition is used to transfer solid displacements to all of the fluid boundaries except the curved faces at the back. 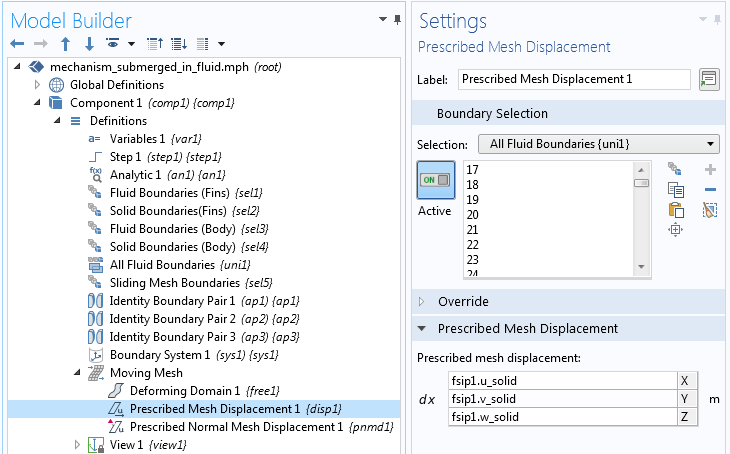 For that, the built-in variables (fsip1.u_solid, fsip1.v_solid, and fsip1.w_solid) are used, which set the displacement of the mesh boundaries equal to the mapped solid boundaries of the identity pairs. At the back side of the solid body, the contact area between the solid and fluid boundaries continuously changes because of the rotational motion of the fins. Using a Prescribed Normal Mesh Displacement boundary condition at these boundaries, the mesh is allowed to move freely in the tangential direction and be equal to the solid normal motion in the normal direction. For that, a normal displacement variable, un_solid = fsip1.u_solid*(nX)+fsip1.v_solid*(nY)+fsip1.w_solid*(nZ), is used, as shown in the figure below. Note that the choice of different Moving Mesh boundary conditions on different boundaries largely depends on the mechanism. There is no general rule for that, and you need to set it appropriately depending upon the dynamics of the mechanism. In many common mechanisms, allowing mesh slip on the boundaries near solid-solid pairs helps to capture system dynamics accurately. Unlike the mesh generated for the union geometry sequence, the mesh on the two sides of a pair may not be matching. As the faces of the elements and the node points are not the same, this may at times affect the accuracy, especially when the relative element sizes across the pair are very different. In cases where you want to have matching mesh on both sides of a pair, you can copy mesh from one side to other. Here, as the mechanism moves forward along the x-axis, the mesh undergoes stretching in the direction of motion. If the displacements are too large, there is a high probability that you may get a highly distorted mesh. In that case, you need to consider the option of remeshing to generate a new mesh. Mesh in the mechanism and lower half of the fluid domain. The time-dependent rotational motion of the fins drives the mechanism. During the first quarter of the simulation time, they rotate equally in opposite directions. This brings the fins closer to each other, leading to the compression of the fluid between them and expansion of the fluid outside. After this, the fin rotation is kept constant. The net forward motion of the mechanism is the result of the transmission of velocity from the structure to the fluid. Displacement and velocity in the mechanism together with the velocity field and pressure in the fluid on the central xy-plane (left) and xz-plane (right). 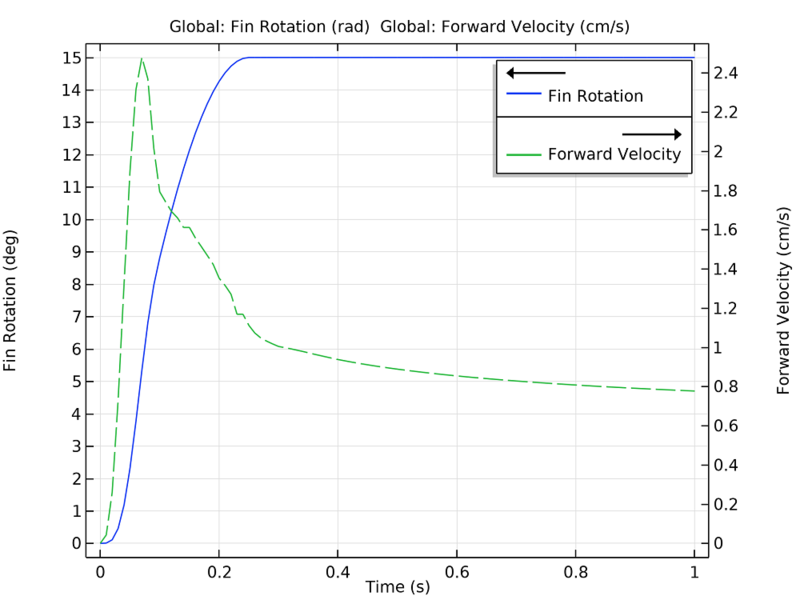 Fin rotation and forward velocity of the mechanism as a function of time. You can further explore some of the interesting dynamics of the system for varying prescribed motion types and other sets of parameters. Below are some common examples where you can use the new Fluid-Structure Interaction, Pair feature to couple a multibody mechanism with a flow field and simulate the large relative motion between parts. 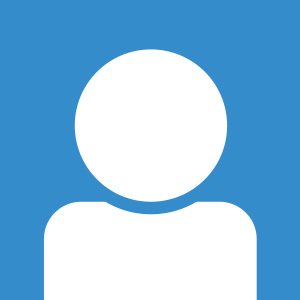 With the help of useful functionalities provided by this feature, you can address similar, or more complex, fluid-multibody interactions in a simple way. To try using the Fluid-Structure Interaction, Pair multiphysics coupling, click the button. Doing so will take you to the Application Gallery, where you can download PDF documentation for the Mechanism Submerged in Fluid model and, with a valid software license, the accompanying MPH-file.